Marshall Tucker Band will perform a live concert in Branson for One Night Only Show on June 8, 2018 at The Mansion Theatre. Coming to the Branson stage this summer, this rock band is sure to impress audiences of all ages. This musical group is known for its blues roots as well as country and jazz tunes, so no matter what music genre you like, you’re sure to have a fun time with this group. Great music awaits to those who want to see this live concert in Branson. Marshall Tucker Band is known for songs like “Heard It In a Love Song”, “Fire on the Mountain”, “Last of the Singing Cowboys”, and more. Formed in the 1970s, Marshall Tucker Band got its start with a self-titled debut released in 1973. The band went on to receive certified Gold in 1975. With subsequent releases after that time, the group saw plenty of success and enjoyed an expansive career in music. Many of their albums received Gold status and their album, Carolina Dreams, went Platinum. The rock band has been wowing critics and influencing major country artists such as Alabama, The Kentucky Headhunters, Confederate Railroad, and Travis Tritt with its definitive blend of rock, rhythm & blues, jazz, country and gospel. Marshall Tucker Band has recorded twenty two studio albums, three DVDs, three live albums and many compilations. The Marshall Tucker Band was founded in Spartanburg, S.C. when Doug Gray teamed up with brothers, Toy & Tommy Caldwell, Paul T. Riddle, George McCorkle and Jerry Eubanks. When they found a key ring from the piano tuner in their rehearsal, they borrowed the name “Marshall Tucker” and The Marshall Tucker Band was born. In 1972, they signed with Capricorn Records, the same record label as The Allman Brothers Band, Wet Willie, and other nationally famed artists. In 1973, the MTB opened shows for The Allman Brothers and began to headline their own shows across America in the following year after they achieved platinum-plus sales of their debut album. After the band made exhaustive tour schedules for years, they earned the respect of critics and countless dedicated fans. With their hit singles like “Fire On The Mountain”, “Can’t You See” and “Take The Highway”, Marshall Tucker Band earned 7 gold and 3 platinum albums while on the Capricorn Records label. In the 90s, the band scored 4 hit singles on Billboard’s country chart and 1 on Billboard’s gospel chart. Movie soundtracks that include Smokey and the Bandit, The Pursuit of D.B. Cooper, Blow, Shipwrecked, Crank 2, Don’t Mess with Zohan, Stop Loss, Take Chance, Swing Vote and many others as well as some TV shows have featured The Marshall Tucker Band. After over four decades, The Marshall Tucker Band continues to be played on classic rock and country radio stations, and they have never stopped touring. 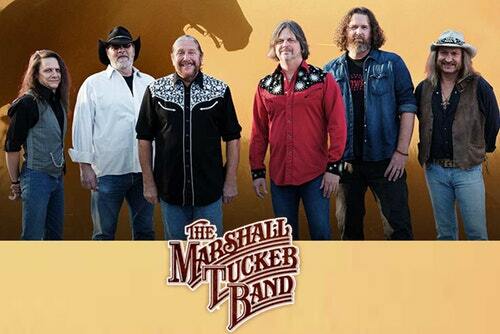 So, don’t miss to see The Marshall Tucker Band as they perform live concert in Branson for one night only on June 8, 2018, 8 pm at the Mansion Theatre.